The 41st annual Oakland county Championships were staged under perfect condidtions at Clarkston High School's year-old track. Nearly every school in the county (with the notable exception of Novi, and a few other schools) were entered in this meet. 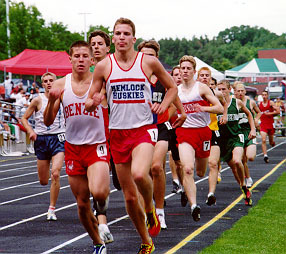 Steve Mance was Foley's lone representative this year and ran the 3200m. Other local competitors in this event were Nick Gillett (Troy), Dan Smith (Berkley), Charlie Visconti (Brother Rice), Dan Murray (Brother Rice), Alex Evrard (Groves), and Scott Collins (Seaholm). The race unfolded with a fast first lap, but Mance started slow with a 72 and was in last. He went through the next lap in 70 to catch much of the feild and move into 5th. In the next 2 laps he moved into 4th, catching Nick Gillett and moving right behind Andrew Bauer, passing 1600m in 4:49. He lost contact with Bauer over the next 2 laps but was still in 4th going into the bell lap. However he had a very slow last lap and dropped to 8th with 100m remaining, but still managed to outkick Micheal Colt for 7th. The MHSAA Division 3 State Finals were held at Comstock Park on June 3rd. Steve Mance was entered in the 1600m and 3200m runs, and was the first Foley boy to compete in the state meet since 1989 (several girls have during the 90's, most recently Kathy Green in the SP and DT). Steve started out fast, knowing that in order to place he would need to be near the school record (4:24). He did not place, but still managed to get a 4 second PR with a 4:32.1. His splits were (65,66,71,70), quite different from his regional PR (72,68,71,65). In the 3200m, nothing seemed to work right. Starting off in 72, he struggled to keep that pace up, hitting 1600m in 4:58. The second 1600m was much worse though, with an enourmous lactic acid buildup, running it in 5:32, for a 10:30 3200m (the second slowest serious 3200m this year, only a 10:34 at MCC in January was slower).